3 top credit agencies and how to keep tabs on them. 4 ways the credit bureau's look at your lending history - and how important each view is. 3 ways to boost your credit score (and it's not just paying your bills). 10 steps to protecting your identity from thieves who may destroy your credit on their joyride across the country. 4 steps to take right away if you think you've been a victim of identity theft. It may not be too late. 5 common credit mistakes you may commit if you don't know about them in advance. How not having any debts may actually hurt your credit score. After you contact the credit bureau about an error in your credit report, make sure you contact these people next. 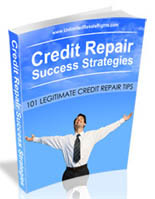 The truth about "free credit reports" online. 3 ways to start building up trust after a major credit disaster. 5 organizations that can help you when you're in over your head. 6 common scams some credit repair companies try and pull. How to use your bank as an ally in your fight against bad credit. 5 ways to curb your spending habit. How to automatically cut down on your spending without beating yourself up. 6 ideas for adding extra dollars to your monthly income. 4 steps to preparing ahead of time for financial emergencies. 7 most common reasons why credit scores are lowered. 3 reasons why change in your life is not always a good thing. When a "late fee" is easily waived. When seemingly small differences in credit scores can have a huge impact on the interest you pay. How to encourage a potential lender to look at you instead of your credit rating. How you can take advantage of being a student while trying to repair your credit. 6 ways to handle the stress of being in debt.